The life of Freddie Mercury deserves better than Bohemian Rhapsody's tedious music-biz clichés. Not every famous popular-music figure has a life that warrants a film biography—but Bohemian Rhapsody absolutely makes the case that Freddie Mercury is such a figure. The artist, born Farrokh Bulsara to Parsi parents in Zanzibar, takes a path from immigrant airport baggage handler to arena-rock frontman phenomenon, all while trying to come to terms with his sexuality as one of the many ways he feels like he doesn't fit in anywhere. This is the stuff of a great character study—assuming that what you want to do is actually make a character study, and not a 134-minute Behind the Music installment. Backtracking from a prologue set in the moments before Queen's 1985 Live Aid performance, the primary narrative begins in 1970, as young Freddie (Rami Malek) introduces himself to the members of a pub band called Smile—guitarist Brian May (Gwilym Lee) and drummer Roger Taylor (Ben Hardy)—on the same night that the band's lead singer quits. The newly-renamed Queen—with new bassist John Deacon (Joe Mazzello)—takes flight soon thereafter, as we watch a 15-year journey into hit records, sold-out concerts and the inevitable internecine personal and artistic squabbles. Freddie meets his eventual wife, Mary (Lucy Boynton), on that same night that he connects with May and Taylor, and it's here that Bohemian Rhapsody at least has the potential to explore some complicated territory. We see virtually nothing explaining what connects them, which is a huge frustration given their ongoing real-life friendship even after he comes out to her. Yet it's still at least the foundation for digging into Freddie's almost desperate quest to find people who will love and validate him, whether it's Mary, his bandmates, his fans, or his lover/enabler Paul Prenter (Allen Leech), who serves the metaphorical Yoko role of the character who threatens to break up the band. Malek bites into his performance with nearly as much gusto as he rolls his tongue around his prosthetic overbite, embodying both Freddie's natural charisma and his difficulty getting comfortable in his own skin. 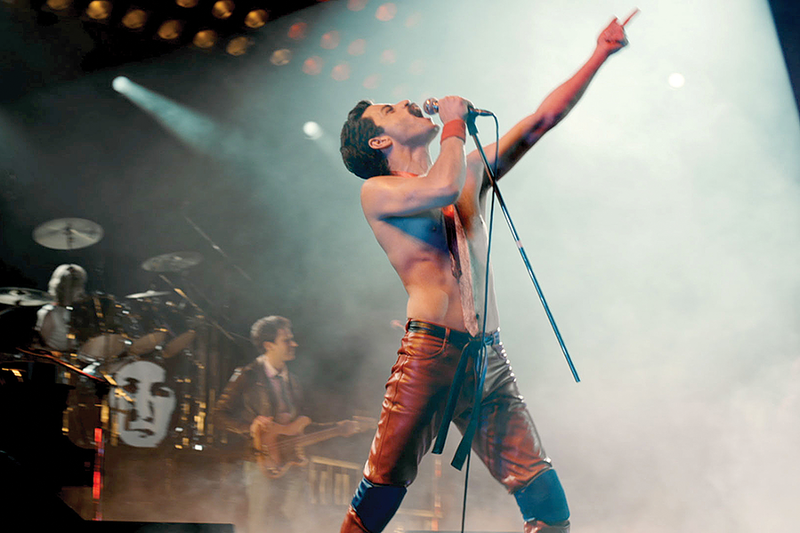 While the vocal performances in the film employ a mix of Malek's own voice and other voices (including the original Queen performances), it's clear that Malek is at least trying to craft a character here that's more than a mere impersonation of Freddie Mercury's on-stage theatrics, leaving aside the awkward attempt to fashion an "origin" scene for Mercury's trademark truncated microphone stand. The problem is that for the majority of Bohemian Rhapsody, Anthony McCarten's script makes it feel like exactly the kind of movie that Walk Hard so mercilessly mocked, practically running through a checklist of tortured-artist clichés. Over and over again, we get scenes of band members coming up with now-iconic bits from familiar songs—the stomp-stomp-clap rhythm of "We Will Rock You"; the strutting bass line from "Another One Bites the Dust"—as everyone stops dead with an immediate realization that they are in the presence of musical history being made. There's the scene of a rebellious Freddie clashing with his tradition-minded father, extended touring montages with city names flying by to convey the dizzying road life, and a scene of the perfectionist Freddie infuriating his bandmates during recording sessions. And there's the clash with an oblivious record company exec (Mike Myers), which in this case seems to exist only for a nudging joke in which the Wayne's World star argues that the operatic 6-minute "Bohemian Rhapsody" will never be a song that "kids sit in a car and bang their head to." It all builds once again to that climactic Live Aid performance, re-created down to the position of Pepsi cups on the piano—and like most of the concert sequences in Bohemian Rhapsody, it's given an unusual amount of time to breathe and showcase the music permitted by May and Taylor's participation in this authorized biography. But even as we see Malek's Freddie holding thousands of Wembley Stadium fans in the palm of his hand, that moment doesn't quite play as a bittersweet triumph for a man who has finally found love, even as he faces the grim diagnosis of AIDS. A bolder movie would have been willing to commit fully to the story of Freddie Mercury as a person, without needing to remind us every five minutes, in the most ham-fisted manner possible, how awesome Queen was.